I am sure I am not the only kid who was scared stupid by this little piece of video. This series of thrillers (some novel adaptations) was shown at both primetime and repeated in the afternoons on ITV. It didnt really matter if you were staying up late or innocently watching the telly in the afternoon, as soon as the night time Thames ident came on (an alternative to the ‘blue sky’ version used the majority of the time), there was a general feeling of unease. It was reality turned inside out, like the walls suddenly dripping blood (which reminds me – click here for more ITV ghoulishness. Once the Thames music faded, the real scares began. 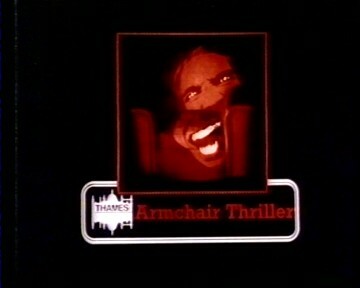 A solitary armchair in a darkened room, then a shadow moving into view, and settling down into the armchair. I know it doesnt sound particularly frightening. Check out the video. The shadow effect, achieved with animation, really does a good job of cranking up the fear factor. Some of the episodes even lived up to the intros mood setting (like ‘Quiet As A Nun’). One of the episodes even made it into the Channel 4 list of 100 Greatest Scary Moments, just behind the magnificent Suspiria by Dario Argento. What were they trying to do to us Kids??? ?